First a paragraph of background. 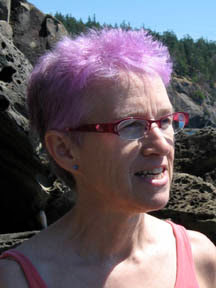 Different strains of H. influenzae differ dramatically in how well they can take up DNA and recombine it into their chromosome (their 'transformability'). Transformation frequencies range from 10^-2 to less than 10^-8. We think that finding out why will help us understand the role of DNA uptake and transformation in H. influenzae biology, and how natural selection acts on these phenotypes. Many other kinds of bacteria show similar strain-to-strain variation in transformability, so this understanding will probably apply to all transformation. The first step is identifying the genetic differences responsible for the poor transformability, but that's not so easy to do, especially if there's more than one difference in any one strain. Step 1: The first step we planned is to incubate competent cells of the highly transformable lab strain with DNA from the other strain we're using, which transforms 1000-10000 times more poorly. We can either just pool all the cells from the experiment, or first enrich the pool for competent cells by selecting those that have acquired an antibiotic resistance allele from that DNA. We expect the poor-transformability allele or alleles from the donor cells (call them tfo- alleles) to be present in a small fraction (maybe 2%?) of the cells in this pool. Step 2: The original plan was to then make the pooled cells competent again, and transform them with a purified DNA fragment carrying a second antibiotic resistance allele. 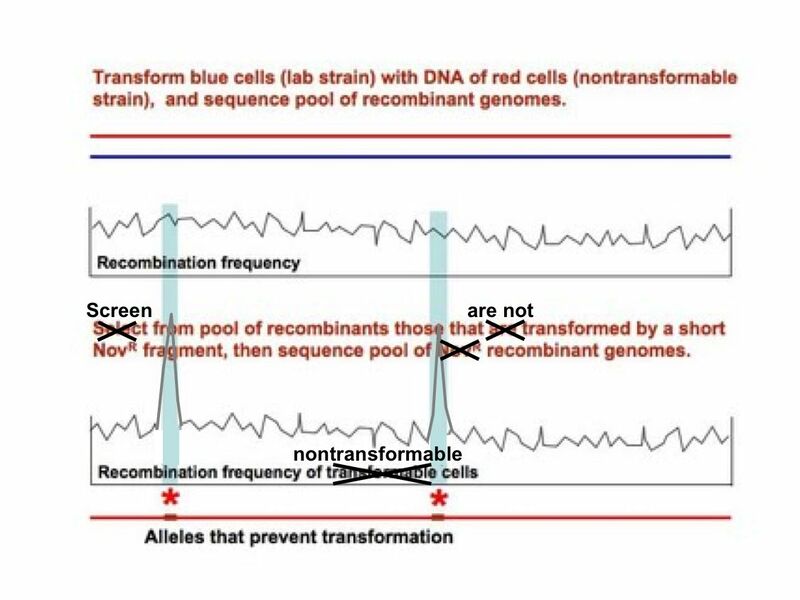 The cells that had acquired tfo- alleles would be underrepresented among (or even absent from) the new transformants, and, when we did mega-sequencing of the DNA from these pooled second transformants, the responsible alleles would be similarly underrepresented or absent. The problem with this plan is that it's not very sensitive. Unless we're quite lucky, detecting that specific alleles (or short segments centered on these alleles) are significantly underrepresented in the sequence will probably be quite difficult. The analysis would be much stronger if we could enrich for the alleles we want to identify, rather than depleting them. The two alternatives described below would do this. Step 2*: First, instead of selecting in Step 2 for cells that can transform well, we might be able to screen individual colonies from Step 1 and pool those that transform badly. We have a way to do this - a single colony is sucked up into a pipette tip, briefly resuspended in medium containing antibiotic-resistant DNA, and then put on an antibiotic agar plate. Lab-strain colonies that transform normally usually give a small number of colonies, and those that transform poorly don't give any. 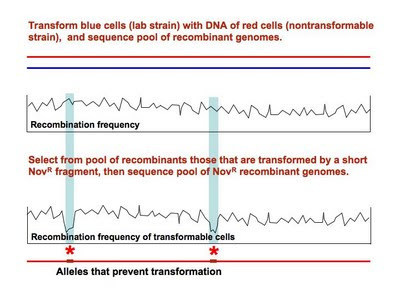 Pooling all the colonies that give no transformants (or all the colonies that fall below some other cutoff) should dramatically enrich for the tfo- alleles, and greatly increase the sensitivity of the sequencing analysis. Instead of looking for alleles whose recombination frequency is lower than expected, we'll be looking for spikes, and we can increase the height of the spikes by increasing the stringency of our cutoff. The difficulty with this approach will be getting a high enough stringency for the cutoff. We don't want to do the work of carefully identifying the tfo- cells, we just want to enrich for them. In principle the numbers of colonies can be optimized by varying the DNA concentration and the number of cells plated, but these tests can be fussy because the transformation frequencies of colonies on plates are hard to control. 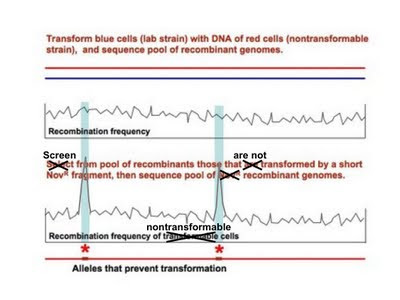 Step 1* (the RA's suggestion): Instead of transforming the lab strain with the poorly-transforming strain in Step 1, we could do the reverse, using DNA from the lab strain and competent cells from the poorly transformable strain. Step 2 would be unchanged; we would make the pooled transformants competent and transform them with a second antibiotic-resistance marker, selecting directly for cells that have acquired this marker. 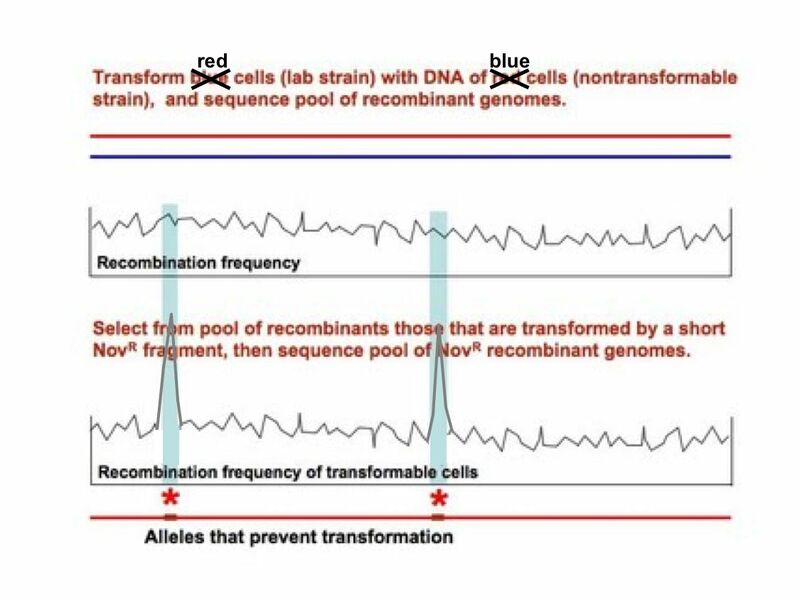 This would give us a pool of cells that have acquired the alleles that make the lab strain much more transformable, and again we would identify these as spikes in the recombination frequency. The biggest problem with this approach is that we would need to transform the poorly transformable strain. We know we can do this (it's not non-transformable), but we'd need to think carefully about the efficiency of the transformation and the confounding effect of false positives. If we include the initial selection described in Step 1, we could probably get a high enough frequency of tfo+ cells in the pool we use for step 2. 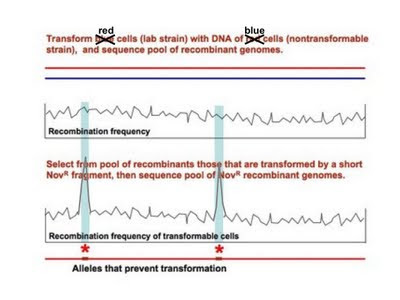 The other problem with this approach is that we'd need to first make the inverse recombination map (the 'inverse recombinome'?) for transformation of lab-strain DNA into the tfo- strain. This would take lots of sequencing, so it might be something we'd plan to defer until sequencing gets even cheaper. I think we may want to present all of these approaches as alternatives, because we're proposing proof-of-concept work rather than the final answer. The first two are simpler and will work even on (best on?) strains that do not transform at all. The last will work very well on strains that do transform at a low frequency..